Wendy "The Snapple Lady" recently appeared at the "Snapple Holiday Rejuvenation Location" in New York City to give away samples of Snapple's Green, White and Red Teas. Snapple also used the event to preview a new blueberry flavor. Ito En is pushing their Sencha Shot as a "green tea energy boost that banishes winter doldrums, excess weight, cancerous cells and cavities, among other ailments." We'll assume that's intended to be a tongue in cheek summation of the product's merits. 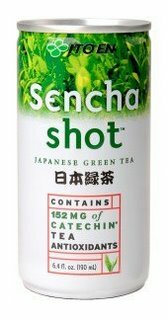 "Each 6.4 fl oz can of Sencha Shot contains 152 mg of the cancer-fighting catechin EGCG. That's 5 times more than the average ready-to-drink green tea, according to the USDA. Sencha Shot contains simply purified water, green tea, and vitamin C. No extracts, no supplements." You may have heard of a company called Coca-Cola. We most recently mentioned them in connection with their "calorie-burning" tea, Enviga. Coke is in more hot water over a beverage they're marketing abroad with the odd name of Ipsei. Another beverage company with a somewhat similar name is not happy about that one. Read all about the legal battle that ensued in this article from Marketing Week.